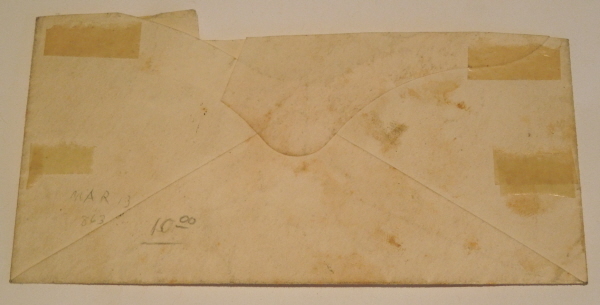 Description:Envelope to Isham G. Harris, the Governor of Tennessee during Secession and the early part of the war. After Nashville was captured by Union forces in February of 1862, Harris and the state legislature moved to Memphis where this letter was mailed to him. After Memphis fell, Harris joined the staff of General Albert Sidney Johnston. At the Battle of Shiloh on April 6, Harris found Johnston slumping in his saddle and asked if he was wounded, to which Johnston replied "Yes, I fear gravely so." Harris and other staff officers moved the general to a small ravine and attempted to render aid, but Johnston died within a few minutes. Harris and the others secretly moved his body to Shiloh Church so as not to damage the morale of Confederate troops. Harris spent the remainder of the war as an aide-de-camp on the staffs of various Confederate generals, among them Joseph E. Johnston, Braxton Bragg, John B. Hood, and P. G. T. Beauregard. After the war Harris became a US Senator from Tennessee. 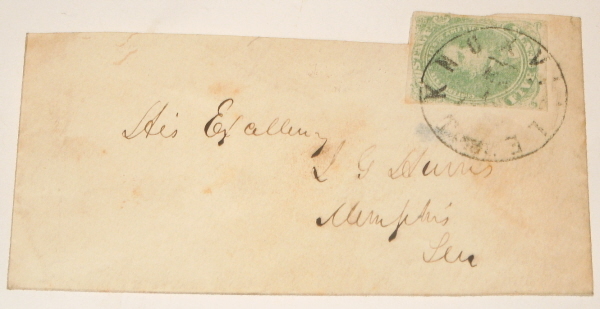 CSA #1 5 cent stamp on cover from Knoxville to Memphis. I do not have a current Scott Catalog, but the 1998 Scott Catalog value for this stamp on a cover was $250. Cover is whiter than it appears in the photograph. Nice Knoxville cancellation on this cover with a hard to find Confederate stamp.